DarwinEssay.Net: Best Writing Essays Ever in Time – True or False? This time we are going to review Darwin Essay, which impressed us with the mistakes in their slogan. However, everybody sometimes makes mistakes, and everybody wants to get top positions in Google using key phrases, so let us check the service’s performance. 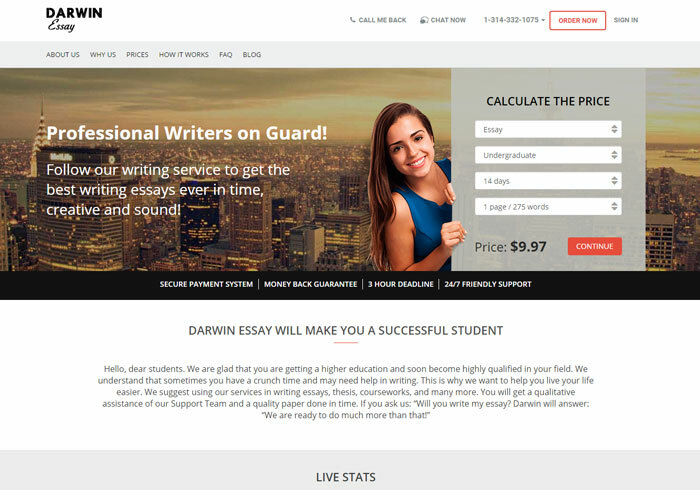 We have checked the prices offered by this service since this is one of the main concerns people have regarding custom academic writing companies. The prices for writing from scratch are average on the market, so you will not overpay with the help of this company. Later we will check how the price corresponds to the quality of the outcome, though. It is not clear whether these two are separate services, or they have the same meaning. Anyway, we see the price which is just $4 less than writing from scratch for 14-day deadline. We are not to judge whether writing from the very beginning is just a bit harder than proofreading, but Darwin Essay seems to think so. Again, it is not clear, what is the price shown for. If this is the price per question, 1 ABC-question will cost you not less than $1. Following the logics of an assignment of the previous type, we can get that the price is given per problem. We do not know how good and objective this is, since problems differ, and efforts needed for their solution differ a lot as well. This is the part that impressed us the most. Firstly, if you want to work with the writer you worked with before, you must pay extra. This means that you actually pay for being a returned satisfied customer, which is a nonsense. Secondly, you can pay extra to get the “best service you can ever get”. Well, this makes us doubt about what kind of service and support you could get if not paying extra for this feature. Thirdly, you need to pay for the plagiarism report to make sure that your paper is original. Doesn’t this come as a guarantee by default? Also, the abstract page will cost you $14.99 extra, no matter what is the deadline for your order. For example, if you pay for High School academic level to be completed within 14 days, this page will cost 1.5x higher than an average page. The price for the order will also become higher if you want it to be proofread before the delivery, but doesn’t it add to the fear of getting a poorly done work? Our team of experts has placed an order on editing of 2 pages. We sent a poorly done paper via e-mail to be checked. We placed the order via phone, however, this left doubts about how good the support team understood the details of an Engineering assignment. The deadline for the order was 3 hours, so we could check how the company coped with urgent tasks. The first thing to mention is that we got the order completed within 3 hours and nearly a half. The support team apologized claiming that there was a technical issue. The paper was hardly fixed, a lot of inaccuracies were left, and grammatical mistakes were still detected. Some new mistakes even appeared. Unfortunately, 3 revisions did not help at all, and we gave up. To finish up, we cannot recommend this service to our readers, since you do not get what you actually pay for.